The appearance of posters in Co Tyrone carrying Continuity IRA warnings to police have been condemned by local councillors as “sinister” and not representative of the community. Featuring silhouettes of two gunmen with the words ‘CIRA, PSNI beware,’ the posters have been erected in the Mullaghmore area of Omagh. 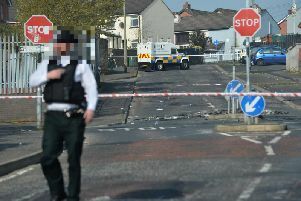 Ulster Unionist councillor Chris Smyth said he believed the threatening imagery is linked to a dissident republican statement issued to the Ulster Herald newspaper earlier this month. “We had an unnamed group who were going to ‘clean up the streets’ and ‘execute drug dealers,’ and I think the two are related,” he said. Fermanagh and Omagh Policing and Community Safety Partnership (PCSP) chairman Councillor John Coyle also hit out at those responsible. “I condemn those kind of posters. It is not for this society,” he said. Cllr Coyle added: “The PCSP in Fermanagh/Omagh is giving confidence to the local community, and that if they need them are able to call them and get things sorted.